For the first time someone told us that we were walking too fast! I love it! Everyone has their own comfortable pace and, for us, the speed we are walking feels just right. Dave and I agree that walking too slow is just as uncomfortable as walking too fast. Not everyone walks all 800 km of the Camino. Many people walk sections of it, returning year after year to carry on from where they left off. On our way out of Villafranca today, we saw several American women who are part of a tour group called MarliCamino. They are spending 15 days walking various sections of the Camino, including the last 100 km so that they can receive their Compostela in Santiago, the certificate that shows they completed their pilgrimage. We congratulated each other for our respective efforts and then “Buen Caminos!” all around. The trail out of Villafranca Montes de Oca climbs through “mountains” with the high point at just over 1,000 meters with its cover of oak and then pine before dropping down to the remote pilgrim village of San Juan de Ortega (St. John of the Nettle) who was a disciple of Santo Domingo. Here, far from the distractions of the modern world, we find a slower pace and time. No major highway was in sight; however, in a remote area there was a bus with a man standing by. When I saw fruit and other snacks on the front seat, I assumed they were for sale. I asked, “Cuanto cuesta, dos bananas?” He told me they weren’t for sale but were for the tour group he was waiting for. Oh, those lucky ladies we met back in Villafranca! Anyway, the kind man handed me a banana and said, “This is a gift! Buen Camino. 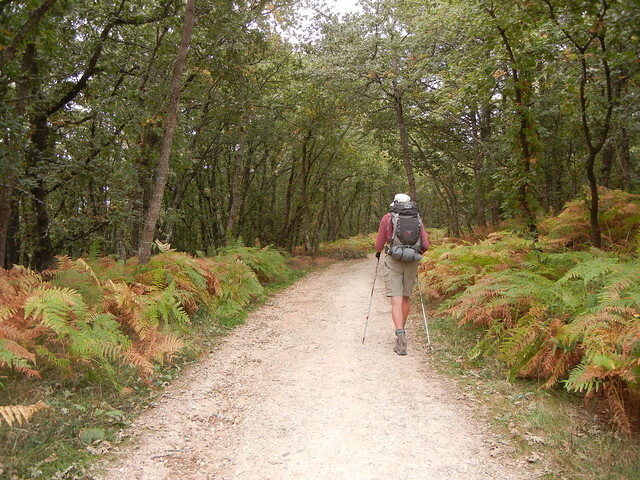 !” They say the Camino gives you what you need and this is just one example. He was a Camino Angel! For the first time, Dave was feeling pain in his back so we didn’t go as far as we had planned. We stopped in Ages, a charming but slightly down-at-heel town that has seen better days. A couple of things impressed us here. An artisan carver was stting outside of his workshop carving tiny pieces of wood. He invited us inside to see his huge collection of intricate buildings, machinery, etc. all carved out of wood. The buildings open up and inside there are such detailed pieces of work, e.g. a bakery which opened up to reveal ovens with doors, handles, and tools for opening them when the ovens are hot. 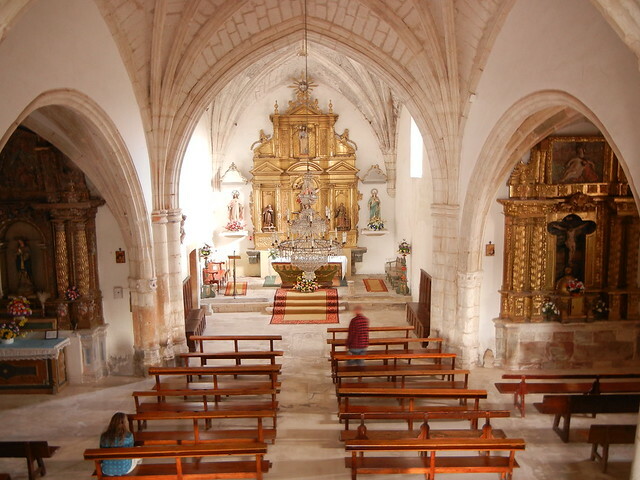 We were also impressed by the church where, once again, we saw huge storks nests. How there can be such big nests but never a stork in sight? 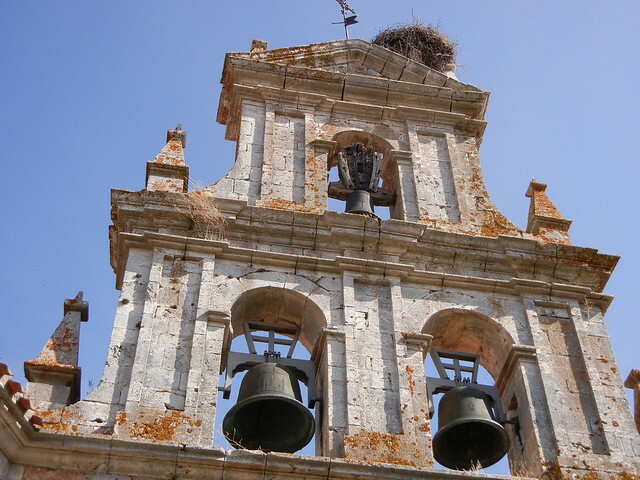 Why do storks nest on churches? We were happy to run into Grace and Jen again today but sorry to hear that Jen is having “Camino moments” that bring her to tears. She is disappointed in the Camino because she isn’t having the inner journey she was hoping for. 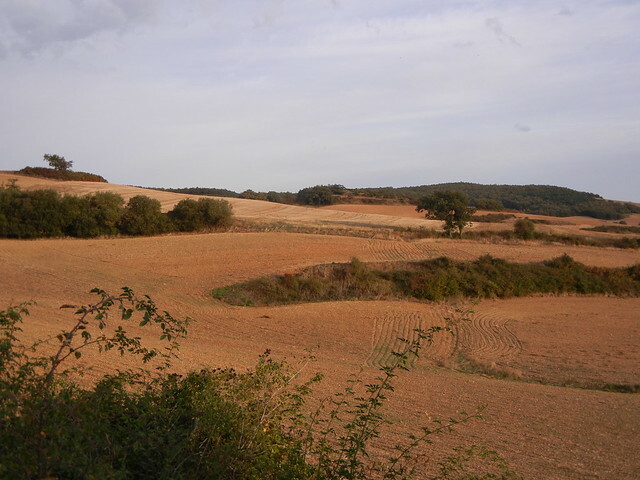 John Brierley suggests this is what we can expect on the Camino, but it isn’t happening for her. To put it bluntly, she is mad at John Brierley for giving her such great expectations. Also, she is having a hard time of letting go of having everything planned and organized, an impossibility on the Camino. I hope we see Grace and Jen again on this journey and we just might. We seem to be keeping the same pace. Here is a story about a lost sock! No peregrino in his right mind would come all the way back to the bottom of a mountain for a lost sock. When we saw one, we picked it up and checked people’s backpacks up ahead for a single sock hanging to dry. No luck, at least not until having dinner at the albergue where we were staying. Dave happened to mention the lost sock and (lo and behold!) the Australians at our table knew that ‘Katrina from Hamburg’ had lost a sock. Guess who walked in? Katrina! There were big smiles when Katrina was presented with her missing sock. The Camino Angels were smiling upon her! One of these days I’ll have to do a load of washing in a real, honest-to-goodness washing machine. Merino wool is not supposed to smell of sweat but it doesn’t have that freshly washed laundry smell either. Maybe tomorrow or the day after I’ll do what I have to do: The laundry! We are at Albergue San Rafael in a room with three bunk beds. Only four beds are occupied and I am here typing under the light of my headlamp. Good-night all. So sad your friend, Jen, isn’t having the experience for which she’d hoped. It’s a long journey she’s travelled for disappointment. A friend of a friend from Oak Bay left last weekend with her husband, to take up where they left over a few years ago and finish the 800 km. I can’t remember which one had knee (or back) problems and they had to leave. You never know, you may bump into them. Can’t tell you how much I am enjoying walking by your side thanks to your blog. I expect we’ll see some great paintings coming from the wonderful photos. You are both a great inspiration! The hiking group is following along too. Hi Judy! Grace and I are in Frómista right now, heading for Carrión de Los Condes tomorrow where we will enjoy a rest day before making the final push into León. I have been doing better the last couple of days. Met some wonderful pilgrims last night where we also visited the Hospital del Alma in Castrojeriz. If you guys pass through there you have to stop. It’s free and totally worth it. Helped lift my spirits. Hope you are doing well. We are hoping to cross paths with you again soon! 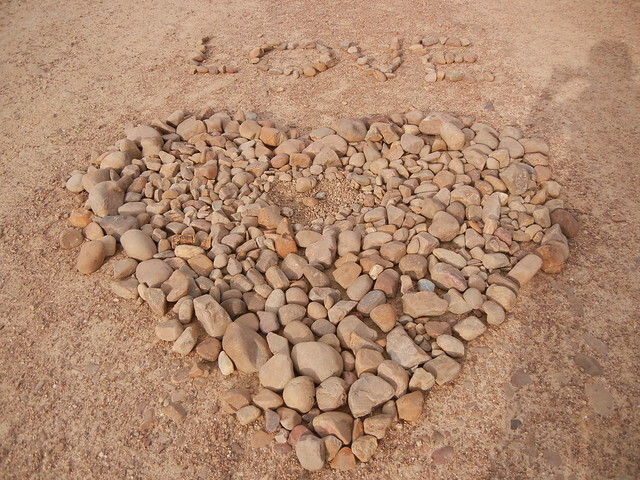 Lots of love from down the road!! Great to hear from you, Jen, and so glad you’ve been doing better. We are in Castrojeriz now and would visit the Hospital del Alma if we didn’t have to get an early start so we can get a place at En El Camino in Boadilla del Camino. It’s been recommended, but there are 48 beds in two dorms. (We might be sorry!) 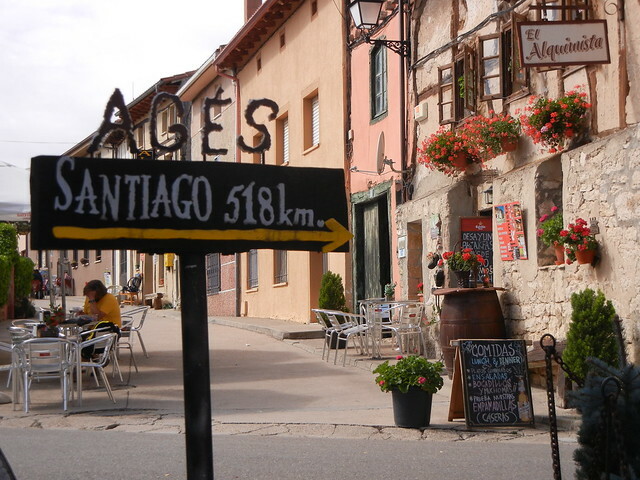 We are doing well although we had a bit of a “blip” just before Burgos – the day after we last saw you. Things are good now, though. Hope to see you down the road. We’re thinking about you a lot. Lots of love, J.